“Decca” Mitford lived a larger-than-life life: born into the British aristocracy—one of the famous (and sometimes infamous) Mitford sisters—she ran away to Spain during the Spanish Civil War with her cousin Esmond Romilly, Winston Churchill’s nephew, then came to America, became a tireless political activist and a member of the Communist Party, and embarked on a brilliant career as a memoirist and muckraking journalist (her funeral-industry exposé, The American Way of Death, became an instant classic). She was a celebrated wit, a charmer, and throughout her life a prolific and passionate writer of letters—now gathered here. Decca’s correspondence crackles with irreverent humor and mischief, and with acute insight into human behavior (and misbehavior) that attests to her generous experience of the worlds of politics, the arts, journalism, publishing, and high and low society. Here is correspondence with everyone from Katharine Graham and George Jackson, Betty Friedan, Miss Manners, Julie Andrews, Maya Angelou, Harry Truman, and Hillary Rodham Clinton to Decca’s sisters the Duchess of Devonshire and the novelist Nancy Mitford, her parents, her husbands, her children, and her grandchildren. 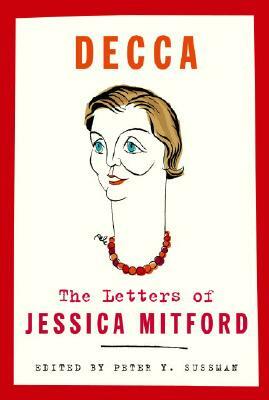 Jessica Mitford is also the author of Hons and Rebels (previously published as Daughters and Rebels), The American Way of Death, The Trial of Dr. Spock, Kind and Usual Punishment, A Fine Old Conflict, Poison Penmanship, Faces of Philip: A Memoir of Philip Toynbee, Grace Had an English Heart, and The American Way of Birth. Until her death in 1996, she lived in Oakland, California, with her husband, labor lawyer Robert Treuhaft. Peter Y. Sussman was an award-winning editor at the San Francisco Chronicle from 1964 to 1993 and has written, edited, taught, and lectured widely since then. He is the coauthor of Committing Journalism and was a coauthor of the Society of Professional Journalists’ Code of Ethics. He lives in Berkeley, California.